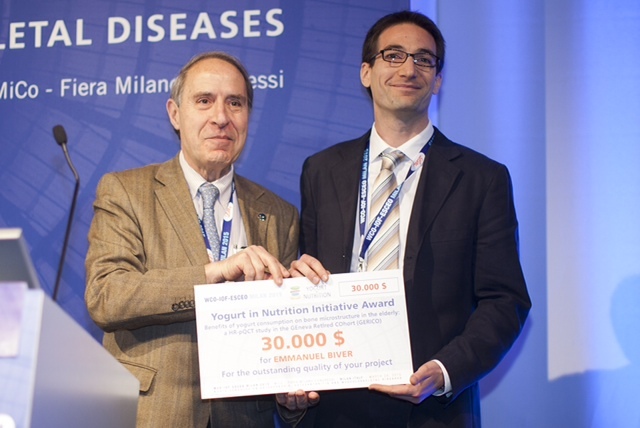 During the World Congress on Osteoporosis, Osteoarthritis and Musculoskeletal Diseases, Dr. Emmanuel Biver, MD, PhD, of the Department of Bone Diseases, University of Geneva Hospitals was awarded the Yogurt in Nutrition Grant. This award supports research study investigating benefits of yogurt consumption on bone microstructure in the elderly.Dr. Biver’s study – ‘Benefits of yogurt consumption on bone microstructure in the elderly: a HR-pQCT study in the GEneva RetIred COhort (GERICO)’ – will look at a prospective cohort of 953 healthy retired workers (men and women, initially recruited at 65±1 years), with the objective of documenting the association between yogurt consumption and BMD, microstructure, and prevalent fractures at baseline at the age of 65. It will also seek to determine the contribution of yogurt consumption in BMD and bone microstructure changes and fracture occurrence during a three year-follow-up of these participants.